From creating fun events to motivate students to take MARTA to piloting reusable metal needles in a Chemistry lab, projects funded by the latest round of grants from Emory’s Office of Sustainability Initiatives (OSI) promote conservation and social justice on Emory’s campuses. 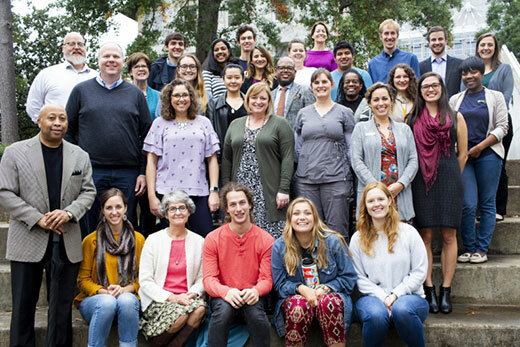 The  General Sustainability & Social Justice Incentives Fund  allows all Emory and Emory Healthcare students, faculty and staff to request up to $3,000 for any project or research related to sustainability at Emory and the intersections of sustainability and social justice. The  Green Offices Incentives Fund  and  Green Labs Incentives Fund  support sustainability in Emory’s work and research spaces by funding sustainable processes and procedures in Emory University and Healthcare offices and labs that are certified through the respective programs. Up to $5,000 is available for proposals that encourage changes in behavior, practices and equipment utilized in these spaces in areas such as energy, water, waste, safety, health, engagement and purchasing. The applications for Incentives Fund grants are reviewed and discussed by a committee of Emory students, faculty and staff from across campus. The reviewers represent a range of programming, academic and operational roles for the university. Applications are evaluated for their alignment with  Emory’s 2025 Sustainability Vision and Strategic Plan, Emory’s Climate Action Plan, feasibility, clarity, sustained impact and innovation. Burn Calories, Not Electricity (Team Leader – Adam Malm): Encouraging use of stairs by providing a stairwell environment that faculty, staff and students will want to utilize. X Fast Fashion (Team Leader – Angela Jiang; Faculty Advisor – Justin Burton): Raising awareness on the true costs of the fast fashion industry within the Emory community, and informing students on how to transition to a more ethical consumption of clothing through a series of free clothing exchanges. Promoting Sustainable Transportation via Community Building and Education (Team Leader – Benjamin Kasavan; Staff Advisor – Riley Perszyk): Encouraging biking at Emory as a viable and attractive method of transportation and leisure through operation of the bike co-op open to the entire Emory community and by planning social and educational events for new and veteran bicyclists. EmPower: Tackling Energy Burdens in Atlanta with Energy Efficiency Upgrades (Team Leader – Daniel Uribe; Faculty Advisor – Daniel Rochberg): Training Atlanta-area K-12 classes about ways to conduct energy audits and install more energy efficient upgrades to homes, as a means to help reduce the energy burden for students’ families. Native Re-Landscaping: (Team Leader – Ellen Dymit; Faculty Advisor – John Wegner): Supporting community engagement events to replacethe landscaped Nandina bushes on Emory’s campus with beautiful, wildlife-friendly and native plant species. KEGS(S) Cup at Goizueta MBA KEGS Event (Team Leader – Harrison Reeves; Staff Advisor – Corey Dortch): Replacing the 7,500 solo cups currently used per semester at MBA KEGS events with reusable, quality cups that students are expected to use at these events. MARTA Now! (Team Leader – Aaron Klingensmith; Faculty Advisor – Justin Burton): Spreading awareness of MARTA within the Emory community by organizing a scavenger hunt throughout the city that centers around use of MARTA trains and buses. Hydration Fuels Creation (Team Leader – Carrie Christie): Retrofitting an existing water fountain on the third floor of the Schwartz Center for Performing Arts, which is frequented by staff, students and visitors. Solitary Bee Hotels (Team Leader – Ellen Dymit; Faculty Advisor – John Wegner): Supporting solitary bees and plant communities by constructing “bee hotels” and by educating the Emory community about their significance. Equitable and Safe Transportation around the Nell Hodgson Woodruff School of Nursing and Rollins School of Public Health (Team Leader – Helen Baker): Promoting safe bicycling and walking with an informational video, educational events, a campus bike inventory and the installation of bike racks outside of the School of Nursing. Acetone Recycling in the Jui Lab (Team Leader – David Vogt): Purchasing, setting up and implementing a workflow to use a large-scale rotary evaporator to recycle the 800 gallons of acetone currently used per year in this chemistry lab, and to be shared by other on-campus chemistry labs. Glove Recycling in the Caspary Lab (Team Leader – Katharine Floyd): Establishing a nitrile and latex disposable glove recycling program for this human genetics lab. Environmentally Friendly Biosafety Cabinet Implementation for the Salaita Lab (Team Leader – Radhika Sharma): Installing a more energy-efficient class II A2 biosafety cabinet for lab cell cultures in this chemistry lab. Minimizing Disposables in the Wuest Lab (Team Leader – Kelly Morrison): Reducing this chemistry lab’s waste production by replacing silicon oil baths with heating mantles and by piloting the use of microscale glass syringes and reusable metal needles. Less Water Waste through a Vacuum Pump for the Hill Lab (Team Leader – Daniel Collins-Wildman): Reducing potable water use of this chemistry lab by replacing a water aspirator with a vacuum pump and cold trap and sharing the new technology with a neighboring lab, and reducing the use of mineral oil baths through implementation of heating blocks. Arts at Emory: On a Mission to Electronic Admission (Team Leader – Stephanie Butler): Eliminating the use of thermal printed tickets, which are not recyclable, through implementing barcode ticket scanners and print-at-home/e-ticketing capabilities for all performances at the Schwartz Center for the Performing Arts. Bikes & Lights (Team Leader – Sara McKlin): Reducing energy consumption by installing motion sensor lighting in each of the five public restrooms in Cannon Chapel. Also working with Transportation & Parking Services to add bike racks outside of the Candler School of Theology and the Cannon Chapel. Hydration Station for Emory Rehabilitation Hospital (Team Leader – Eric Holshouser): Installing a hydration station on the first floor of the Emory Rehabilitation Hospital for use by staff, faculty, students, patients and guests. Hydration Station Installation for the Carlos Museum (Team Leader – Kate Stanton): Installing a hydration station at the Carlos Museum for use by faculty, staff, students and visitors. Hydration Station Installation Implementation Phase 2 for the Miller-Ward Alumni House (Team Leader – Alison Agnew): Installing a hydration station on the second floor of the Miller-Ward Alumni House to reduce single-use bottled water waste generated by staff and guests. Water Fountain Replacement with a Hydration Station for Theater Studies (Team Leader – Lydia Fort): Installing a hydration station by replacing the current water fountain with a water bottle-filling station on the fourth floor of the Rich Memorial building, for use by faculty, staff and students.